Contrary to the Navy’s own policy, and despite spending nearly $16 billion on average in each of the last 30 years on new warships, most U.S. combat vessels are delivered from private shipbuilders with flaws significant enough to impair the vessels’ ability to perform missions or to keep crews safe, according to recent audits conducted for Congress. Take the USS Coronado, one of a class of small shore-hugging vessels called Littoral Combat Ships. The Navy accepted the Coronado in 2013 even though its system for distinguishing enemy ships and aircraft from friendly ones wasn’t working, according to the Government Accountability Office. What’s more, a key radar was so flawed it could have fired missiles in the wrong direction. Both deficiencies were only fixed months after the Coronado was already in use. The Coronado also experienced frequent breakdowns in a communications system. And a coupling on one of the ship’s engines broke in the Pacific Ocean, causing the crew to return to port for repairs. “I just wish there were people brave enough to say, ‘Damn the torpedoes, this has to change,’” said Craig Hooper, a former vice president at Alabama shipbuilder Austal USA, which constructed the Coronado. Hooper is now a senior analyst at the Gryphon Scientific consultancy. The Navy did not respond to repeated requests for comment. Spokesmen of the two main shipbuilders — General Dynamics Corp. and Huntington Ingalls Industries Inc. — declined to comment. Austal did not respond to requests for comment. Quality control will become more critical than ever in the years ahead. The Navy is seeking $24 billion in fiscal 2020 for warships — the largest such budget in 20 years, adjusting for inflation. Some in Congress are taking notice of the quality-control issue. The Pentagon’s complex acquisition system sometimes may even encourage shoddy work, critics say. Some contracts require shipyards only to do their best to deliver a quality product on schedule — but not to actually do it. In many cases, shipyards first get paid to build ships and then often get paid again to fix things on the ships that should not have been broken, analysts say. When exterior paint on one of the San Antonio class ships began to peel shortly after delivery due to a contractor mistake, the Navy paid the company still more money to repaint the ship. Taxpayers have footed the bill for 96 percent of the repairs required because of contractor defects, costing at least tens of millions of dollars, auditors say. 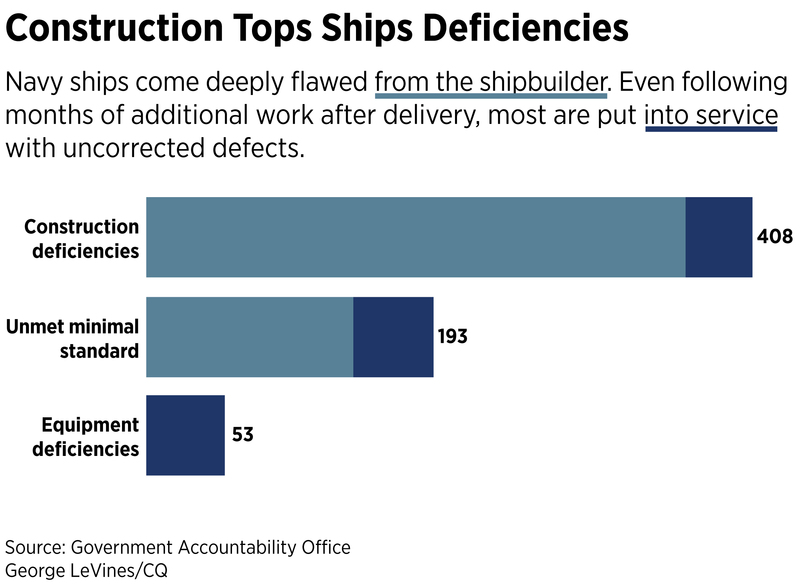 Only recently, in response to GAO criticism, did the Navy at least stop paying contractors profit for fixing some of their mistakes. Sailors who deal with the consequences of a broken engine or a weapon system that is not operable — or whose ship cannot deploy because it is undergoing maintenance to fix a preventable snafu — are the ones who feel the fallout. Deficient, out-of-commission ships mean more work for sailors on functioning vessels, creating the kinds of stress and fatigue that contributed to the collisions in 2017 that killed 17 sailors. “Because new construction ships are late getting to the fleet, the ships in the fleet are getting worked harder, and that is exactly one of the factors the Navy raised in its ship-collision reports,” said Bryan Clark, a former aide to the Navy’s top admiral. Clark is now an analyst with the Center for Strategic and Budgetary Assessments, a defense think tank. And the problem may get worse. Retired Rear Adm. Robert Wray, a former chief of the Navy’s ship inspections board, or INSURV, thinks the Navy has diminished the board’s power by reducing the rank of its director and making him report to a command often more interested in positive news than honest assessments. There are sometimes good reasons for accepting a sub-par ship and fixing it later. It can be cheaper and get ships — even imperfect ones — into the fleet faster. Moreover, even if some key systems on a ship aren’t working when the Navy takes ownership, sailors can sometimes train for other missions while awaiting the fixes. Still, many experts worry that by habitually accepting broken products, and paying still more to fix them, the Navy may be encouraging more of the same. “Pushing deficiencies to the fleet could become a slippery slope that requires careful discipline on the part of the Navy,” said John Young, former chief of acquisition for the Navy and later for the entire Defense Department. While some factors can justify deferring repair work until after a vessel enters the fleet, “this should be the very rare exception,” he said. The Navy’s goal is to build as many ships as quickly as possible to justify its budget, according to H. Lee Buchanan, another former chief of Navy acquisition. “There is a culture that perpetuates this that is going to be very hard to break,” Buchanan said. The Navy and the shipyard want to get ships off the so-called ways — the structure that props up ships under construction — to protect the service’s budget, whether or not the vessels contain serious flaws, he said. Unlike commercial shipyards, Buchanan said, the Navy’s shipyards are not penalized for lateness. And Congress typically agrees to pay the cost of any needed fixes. The technical problems on most Navy warship programs almost always start, experts say, with the Navy launching a new class of vessels before its technologies are mature, and then building ships before their designs are complete. The pattern that ensues is predictable. As technical problems cause contract costs to balloon and schedules to slip, the brass typically decides to just get the ship out of the shipyard where it was built and move it to Navy ports — and then solve the remaining equipment glitches. In addition, the Navy mostly avoids doing the most demanding type of testing until after most of the ships in a class have been ordered. A “ship shock test,” which exposes one vessel in a class to underwater explosions that gauge its ability to survive in combat, is usually performed only after the program is a fait accompli. Once it gets the keys, the Navy invariably celebrates “delivery” of another ship and completion of another contract. But important work in most cases remains — including correction of major defects. Most warships still have at least a few major quality problems even when the fleet starts operating them, which happens only after an increasingly intense “post-delivery phase” for last-minute fixes — a phase that now lasts months or even years. The post-delivery phase is designed to be for finishing touches, but it is now essentially an extension of the ship’s construction stage. The most significant equipment snafus — known as “starred deficiencies” — can degrade a ship’s ability to perform key missions or jeopardize the crew’s safety. The Navy allowed ships to be delivered without fixing 90 percent of the starred deficiencies identified prior to delivery, GAO has said. Most starred deficiencies are now fixed before the ship enters operations, according to the GAO. However, in some cases — such as the Coronado — ships entered service in the fleet with starred deficiencies. But fixing those deficiencies is not enough, analysts say. 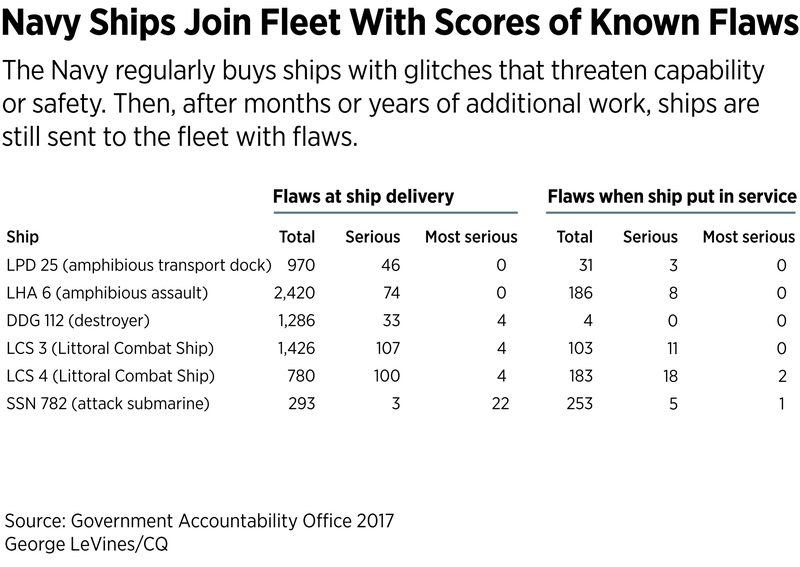 The next most serious flaws — known as Part 1 deficiencies — typically go uncorrected even after most ships that the GAO studied were in use. If a ship has Part 1 flaws, it may mean the vessel is not seaworthy or its ability to carry out missions is substantially compromised, according to Navy documents. For example, the USS America amphibious assault ship, which is a smaller version of an aircraft carrier, joined the fleet with eight Part 1 deficiencies, including a faulty sea refueling system. “The level of deficiencies the Navy is willing to accept has gone too far,” said Clark, the former aide to the Navy chief. On top of these defects, unforeseen problems also frequently arise during the first few months of a ship’s operations. The San Antonio class of amphibious ships, which transports Marines and their vehicles across the oceans, had “catastrophic” engine failures and electrical problems that included “total loss of electrical power,” the GAO reported last year. Steering equipment was faulty on at least one of the San Antonio ships. Navy officials told the auditors they still have “significant concerns about the quality” of that class. Similarly, on one Littoral Combat Ship, the USS Fort Worth, sailors were unable to retrieve a faulty anchor — a defect the Navy thought had been fixed before the ship launched. Then there are basic performance shortcomings. Another LCS ship, the USS Freedom, could not travel sufficient distances. And yet another, the USS Independence, was too slow. Both also had problems in systems designed to fight other ships and to combat sea mines. Some say making the shipyards pay would be a pyrrhic victory — contractors would just add the cost to the next project. Shelby Oakley, a director of the GAO’s national security acquisitions auditing team, acknowledged the limits of the government’s leverage, but said the Navy can still improve its oversight through improved use of warranties and inspections. And, she said, the Navy can clarify what constitutes a “mission capable” ship, because different programs have different standards for when a ship is ready to fight. In other words, the government is not powerless. “The builders need ‘us’ as much as ‘we’ need them,” she said.